The highest point along the Monterey Peninsula, Jacks Peak is the go-to trail run for locals who want to skip the busier tracks along the coast and still get in some killer views. The Jacks Peak County Park is just 15 minutes from downtown Monterey, and you’ll tackle most of the elevation on the drive up, so you don’t have to be intimidated by the steep hill climbs that mark many other Big Sur trail runs. The park has over 8 miles of trails to choose from — most of it well-maintained, non-technical, single track. For the best views and ease of access, we recommend a ~3 mile route starting at the parking area and heading out via the Rhus Trail. At the intersection, take a right onto the Iris Trail which loops back towards the Skyline Trail. There is a nice little climb here, where the Skyline Trail switches back and up for a couple hundred feet to the peak. Once you enjoy the views, you can either return to the lot via the Skyline Trail, or extend your run with an extra loop around the Coffeeberry Trail and back. 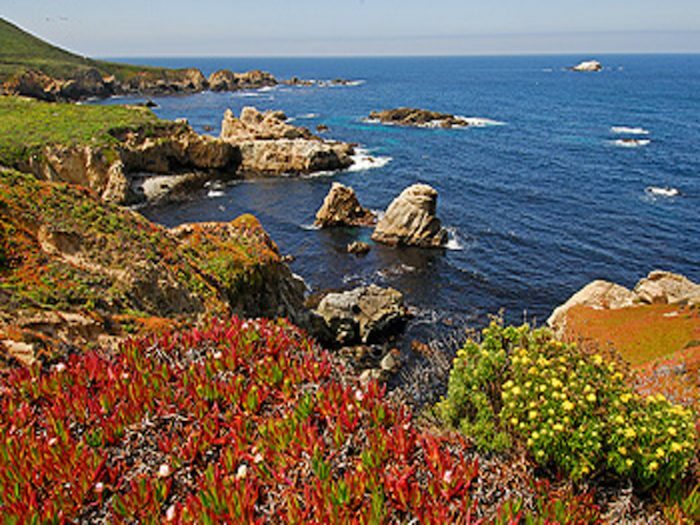 On either route, you’ll have the chance to see some Miocene fossils, along with stunning views of Monterey Bay, the Carmel Valley, and the Santa Lucia Mountains.